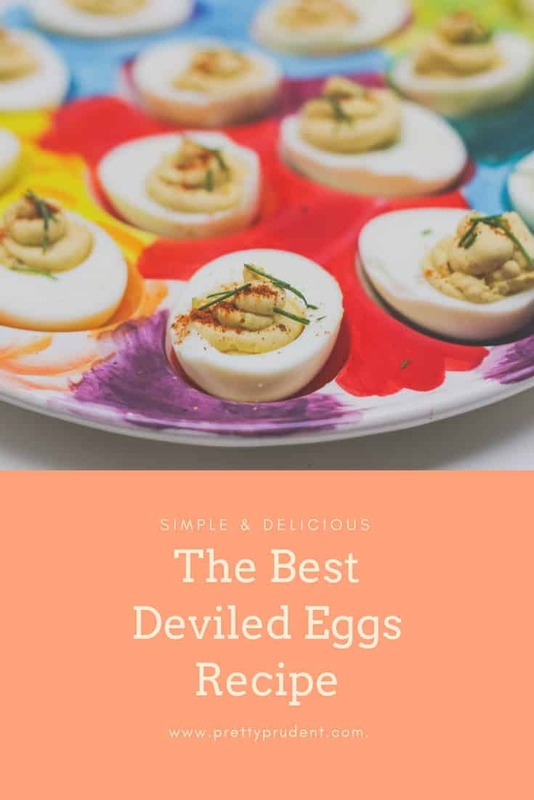 Deviled eggs are a classic party appetizer (the best holiday appetizer if you ask anyone in my family, including my kid, who is kinda picky, yet gobbles them up), but they also seem quite fancy and difficult to make. They are not. 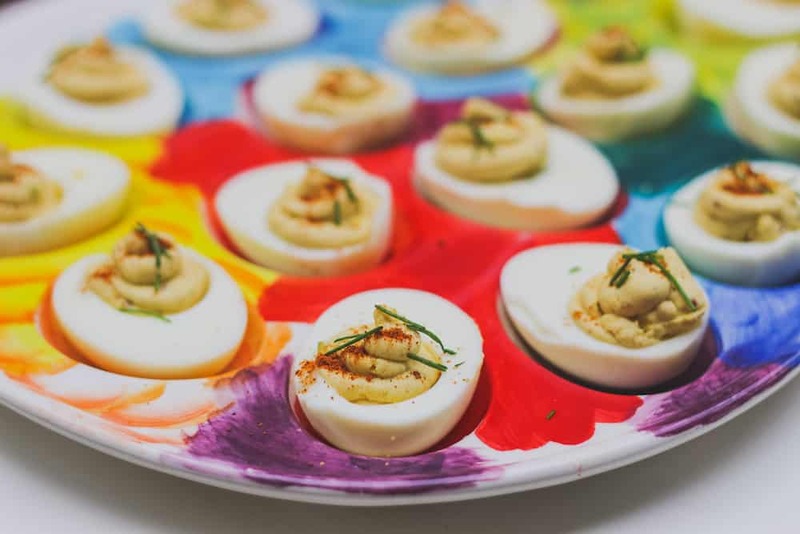 So really deviled eggs are the perfect appetizer to impress your guests, without stressing yourself out. So go forth and devil eggs, my friends! Here is our simple take on the best deviled eggs recipe. The key is a creamy yolk and just the right dash of acid from vinegar. The best deviled eggs recipe: A delicious and easy recipe for classic deviled eggs. We prefer the instant pot, not because it’s much faster (it isn’t), but because your eggs come out easy to peel! The shells slide right off. So we are offering two ways to prepare the eggs. Use manual settings, high pressure for 8 minutes. Do a quick release, then remove the eggs to an ice water bath and let chill for 5 minutes. Peel and slice in half. Discard the two worst-looking halves. Transfer all yolks to a small mixing bowl. Place eggs in a medium saucepan. Add water to cover the eggs completely. Bring water to a boil. Once boiling, turn off the heat and cover eggs. Let stand 10 minutes. Transfer eggs to an ice water bath and let chill for 5 minutes. Peel and slice in half, discard the two worst-looking halves. Transfer all yolks to a small mixing bowl. Mash yolks until no lumps remain. Add mayonnaise, cider vinegar, mustard, Worcestershire sauce, salt and pepper. Mix with a rubber spatula until smooth. Place mixture in a pastry bag fitted with a wide tip (open star or circular is great), or alternately, place in a plastic zip bag, and cut a teensy bit of a corner off to pipe through. Pipe mixture into egg whites, mounding about 1/2″ above the white. Sprinkle with paprika or chopped chives if desired. Serve these at room temperature and watch them disappear! That was easy, right? Did you save some for your guests, or eat them all before they even arrived? (Been there, done that.) If you enjoyed the best deviled eggs recipe, check out more of our appetizer recipes, including our more-delicious-than-it-sounds and super-popular recipe for How to Make a Stuffed Pumpkin, this recipe for easy, but beautiful to present Sweet-and-Savory Pumpkin Spice Skewers, this quick and tasty Asparagus Pasta Salad recipe, or have some holiday fun by making Soft Pretzel Candy Canes. Follow us on Pinterest for more recipe, party, and craft inspiration.